“I have always said that you do not see a thing until you look away from it. In other words, an object or a fact in nature has not become itself until it has been projected in the realm of the imagination. 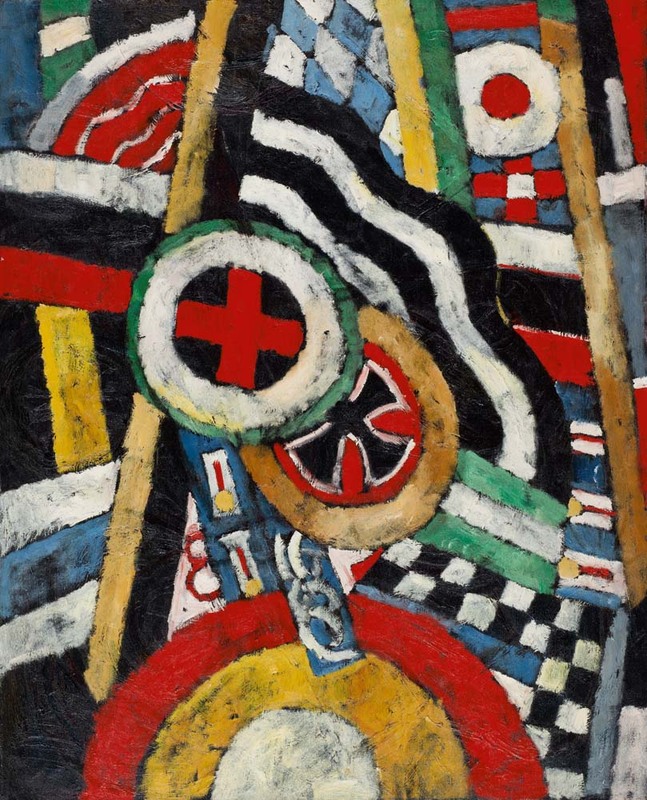 Marsden Hartley (1877-1943) is a favorite of mine both for his paintings and his words, which often express thoughts about painting that ring true for my own experience. For example, I love this quote above. Some of the strongest images for me are those that are taken at a glance, sometimes while driving down the highway at 70 miles per hour. If the imagery strikes me in a powerful way, my mind immediately starts breaking down the image into a sort of shorthand, blocking in the forms and organizing them in a way that registers deeply. It is simplified but contains the elements and the effects that struck me. Sometimes I will move my arms while doing this, trying to create a muscle memory of the rhythm of that which I am seeing in my mind. The image is thus entered into my imagination. Everything else around it that is not part of image that spoke out to me seems to not exist in that moment. It s a funny process and is deeply ingrained to the point that I don’t even think about it but for this reminder from Hartley. Got to get to work. Have a great day. I have completed a number of paintings in my Multitudes (or Masks or Faces or whatever the hell I am going to call them) series in the past couple of months and I still can’t quite put my finger on what they truly are or what purpose they serve for myself. As I’ve said, many of these faces have lived with me for most of my life. They are absolutely familiar. Maybe even going to the base of the word, they seem like family. The overall effect from these pieces for myself is not a stirring of one single emotion. They are a compendium of feelings. Some are benign and some are very kind faces. Some are worried and fearful. Some seem lost in thought and some just seem lost. Some are angry and some even contain a bit of menace and hatred. The massing of them tends to balance the emotions for me. 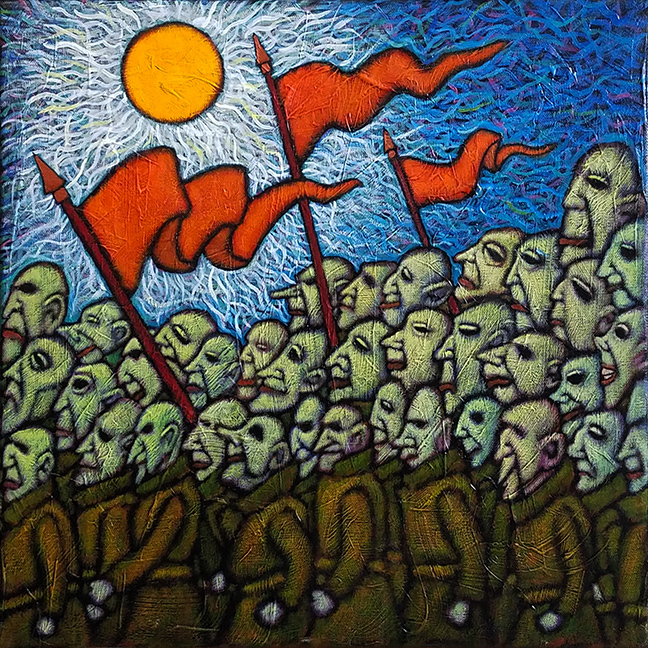 This seems less so in the piece shown above, an 18″ by 18″ canvas that I originally called The March. It’s a piece that I find very appealing in so many ways, especially in the glow its colors produce in any kind of light. The colors, especially the orange/red of the flags, seem to pop off the surface and at a glimpse it seems almost festive. Maybe a celebratory parade? But the more I look, the more it frightens me, seemingly capturing some innate dread of mine. I see in it a reflection of some of the craziness that is in great abundance around the world at this juncture in time. Waking this morning to hear of the 49 people slain by a white supremacist as they worshipped in their mosques in New Zealand only reinforces this sense of dread and looking at this piece, I see in it the willingness of people to join in, to sacrifice self and sense to become part of a mass movement to march under a banner that divides more than it unites. The joy and snap of the banners that I first saw in this painting have become something else. They now represent a emboldened expression of feelings and beliefs that is sanctioned by the crowd. Most had been rightfully restrained in shame for decades and centuries but have now been unleashed. They now seem to me like banners of ignorance and stupidity, of racial hatred and blind allegiance to dead ideals. It was never intended to be so. I just painted it as it came to me, delighting in the colors and forms as they came together. It came easily and freely, giving me great pleasure and joy as I painted it. But now when I look at the faces and bodies with their uniform shade of color, I see a parade of old white men marching to protect that which they see as their god given sense of entitlement. Even the poorest among this crowd believes that the earth is their’s alone, that they reign supreme over all races and species. In it I see this crowd as believing this is their last ditch effort to maintain this imagined supremacy. That now is the time to take this world back. And in the world outside this painting, I sense the same. It is a worrisome and dangerous time. We must be vigilant against this parade of fools. And after writing this this morning, maybe that is what the title should be. Parade of Fools– that will be its title, after all. Funny how the perception of a piece can change with time and circumstance. The fact I myself do not understand what my paintings mean while I am painting them does not imply that they are meaningless. 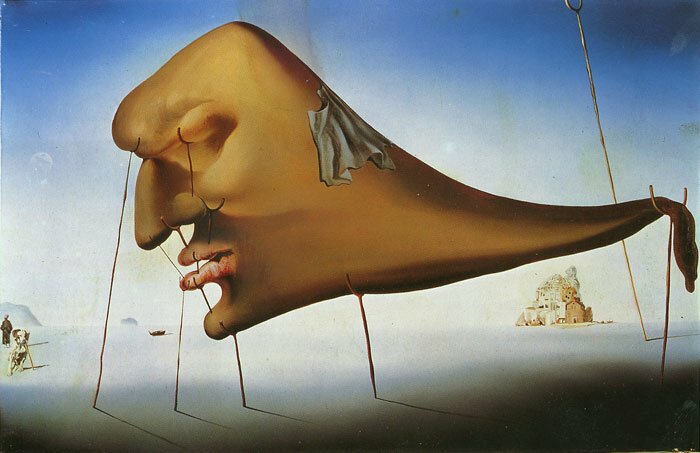 Been writing this blog for over ten years now and this is the first post about him so you might understand when I say that I am not the biggest fan of the work of Salvador Dali, the famed Spanish Surrealist painter who died in 1989 at the age of 85. 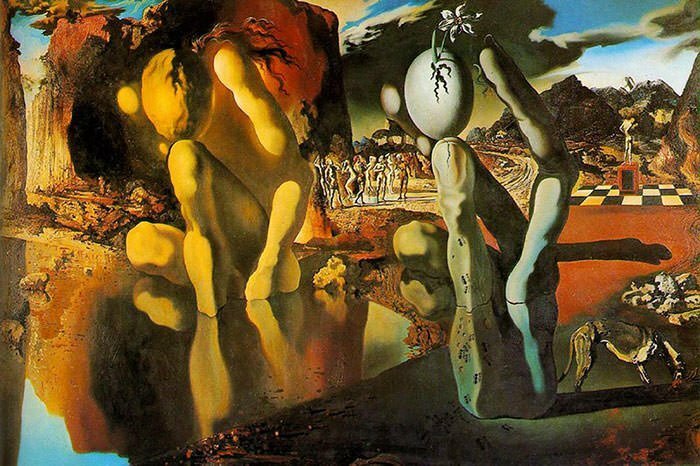 His work was always visually interesting, sometimes in a disturbing fashion, and was painted in a high traditional manner. Some of it is beautiful work. But it just never fully clicked with me. Some pieces I liked very much and others left me completely cold. I will say that for me and many people of my age, he was the face of art, being one of the few artists who sought (and found) attention on television. 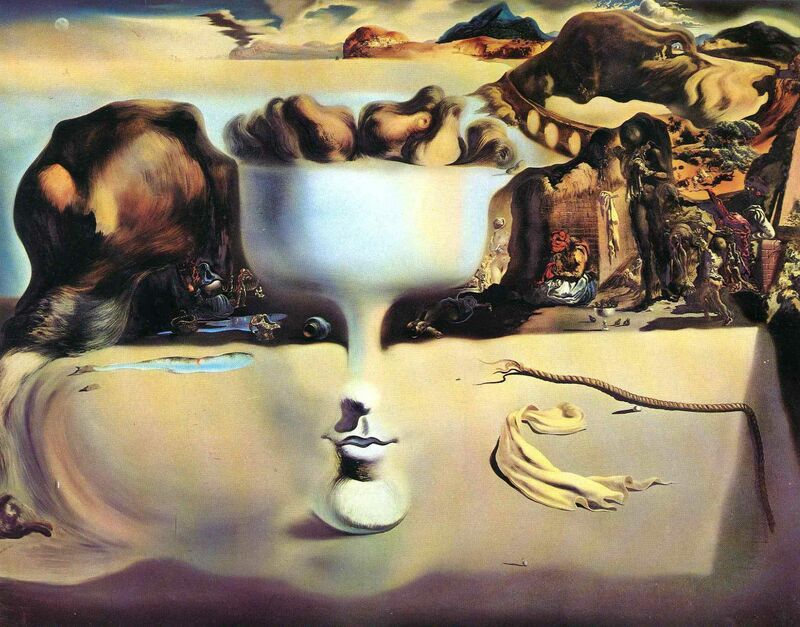 If you had asked me at the age of 12 how an artist might act, I would most likely have described the wild antics of Dali that I had observed on a variety of shows of that time. He was always eccentric bordering on a lunacy that, even as a kid, I could never decide was real or contrived. And maybe it is this public persona, the one that had him seemingly mugging and posing for attention at every opportunity, that tainted how I looked at his work. 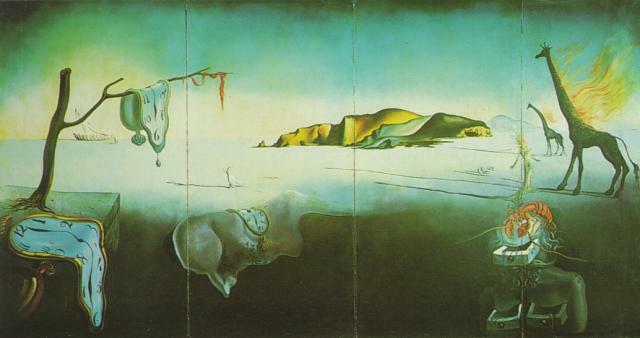 Sometimes it seemed like his paintings were doing the same– just trying too hard. A little too engineered and manipulative. Nowadays, I try now to set aside that image of his persona and focus now on each painting individually. It allows me to fully enjoy the work that speaks to me and to simply take in the others. If you understand a painting beforehand, you might as well not paint it. Both quotes could apply to my feelings about my own work. I have often felt that the best and most alive work is produced when there is no contrivance, no clever idea at the beginning of how I can manipulate a response from the viewer. Almost as though there is an absence of forethought, a void that allows the subconscious mood at the moment to dictate in color and form without the dull, wooden clutter of thought out cleverness. Sometimes, I find that the paintings that I expect the least from when beginning often produce the most when done. You might disagree with this. Your argument might be valid. I will not argue the point and can only speak for myself and my experience. 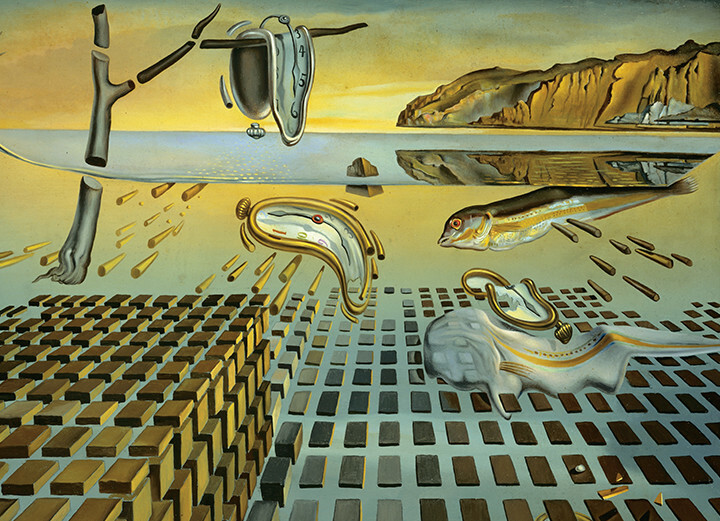 I apologize for not going into more detail on Dali’s career here but there is a ton of material out there that anyone can easily find. I thought I’d just share a few words and images for you to consider. You make your own judgments. Who would have thought that the creator of Sherlock Holmes would have some good advice to offer to artists? The words above from Sir Arthur Conan Doyle about how he he would sacrifice accuracy of detail in order to gain greater dramatic effect in his work are very enlightening. 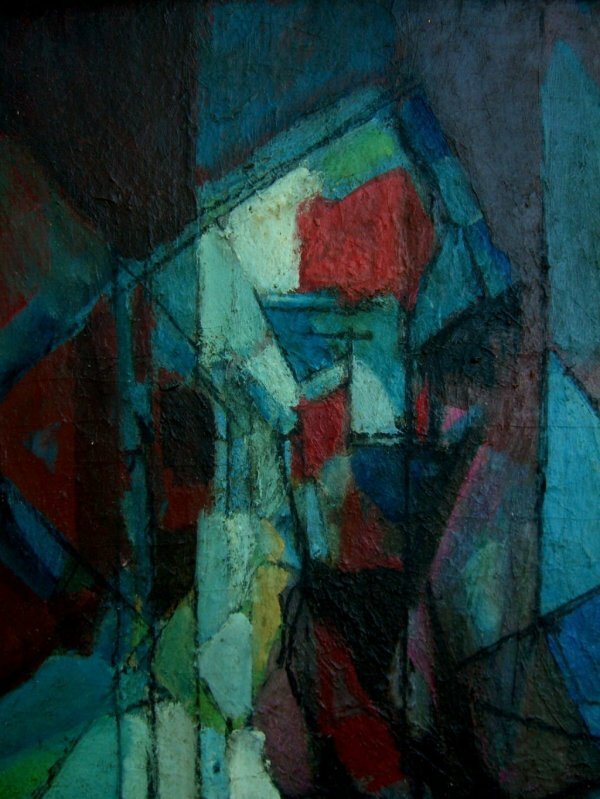 I have been going through a lot of older work from over twenty plus years back when I was still in a formative stage with my painting. I hadn’t read these words from Doyle but one of the first conscious decisions I made about my work was that I would not be a slave to detail, that I would slash away as much detail as possible while still conveying a sense of what was being represented. Oh, I would use smaller details when they served the greater effect of the painting but the fewer the better. 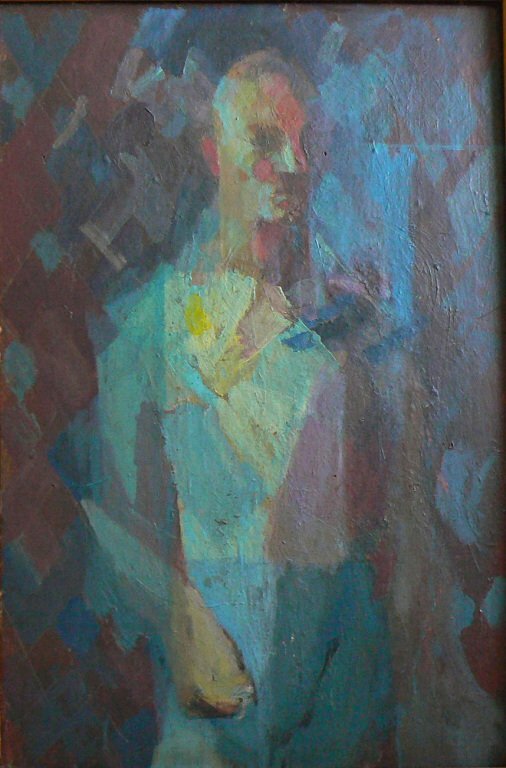 One example from this early work is the piece at the top that is from around 1997. 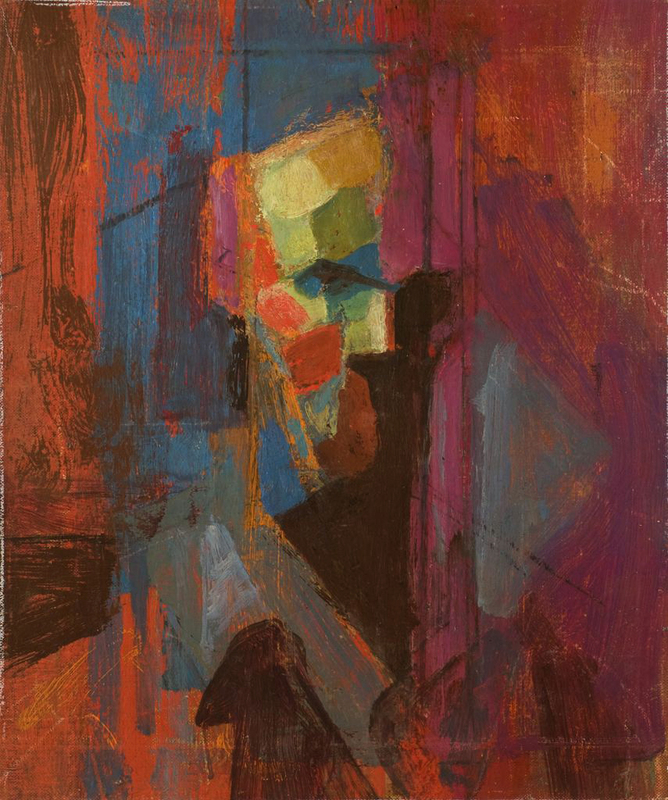 I was surprised when I came across this small painting in a file folder that I hadn’t examined in many years. It was a solid example of the work I was doing at the time, mainly in watercolor with the beginnings of my relationship with the acrylic artist inks that have long been a staple of my work. 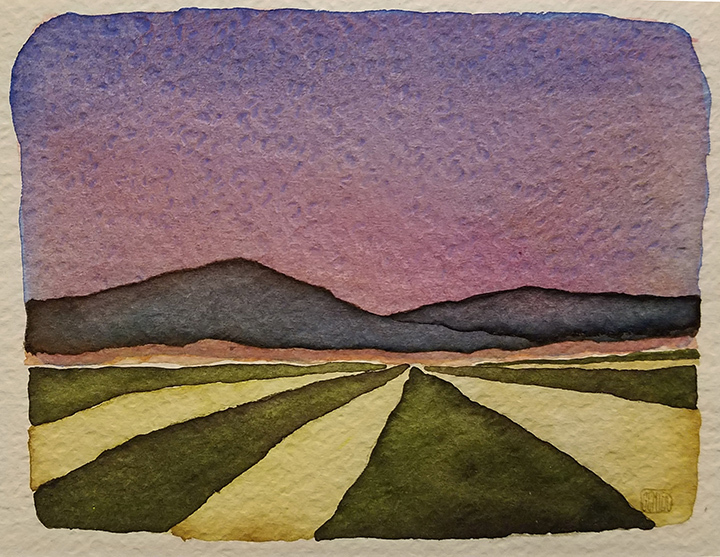 It is sparsely detailed with little consideration to trying to replicate natural color. It just allows the colors and the shapes do what they will in communicating a sense of place and feeling. It works pretty well for what I want from it. Over the years, I sometimes have strayed from this credo of spareness but I always find my way back to it. There just seems to be more space for the expansion of feeling when details are cut away. It’s a good thing to keep in mind. So, thanks for the reminder, Mr. Doyle. I can use all the help I can get. I wrote the post below about Earl Kerkam about five years ago. 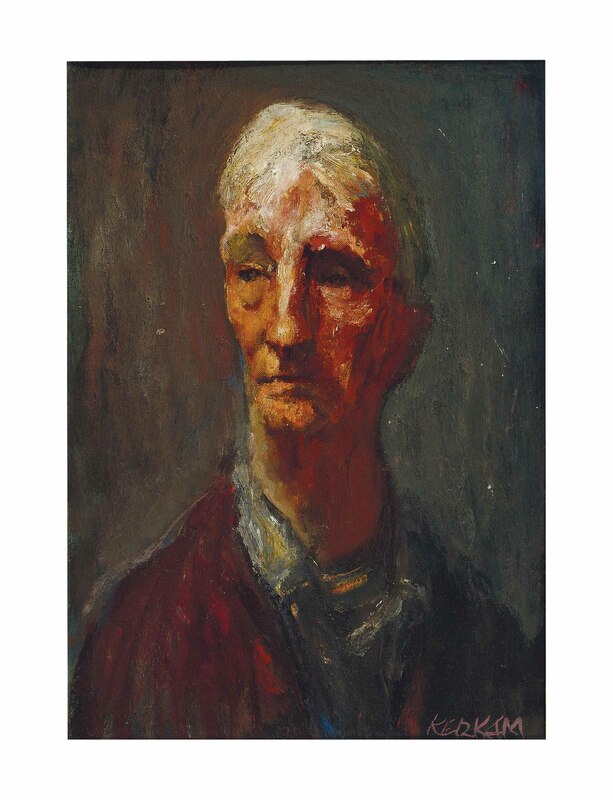 He is an enigmatic character, a painter praised by many of the giants of modern art yet vastly underappreciated by collectors and the general public. I thought I would revisit it today (along with adding a few more images) after going through some auction records of his work from recent years and finding that he is still tremendously undervalued. As I sometimes point out, the artist can only control his creation of the work, not how it is perceived by the outside world. Earl Kerkam is a fine example of that. I am very interested in the painter’s painter, those artists who garner the respect and admiration of other artists while often not attaining the same sort of attention from the general public. I try to figure out where the disconnect comes in how these artists are perceived so differently by these two groups. I recently came across a prime example by the name of Earl Kerkam, a NY painter who lived from 1891 until 1965. Kerkam trained in some of the finest art academies here and abroad, studying for a while with Robert Henri. 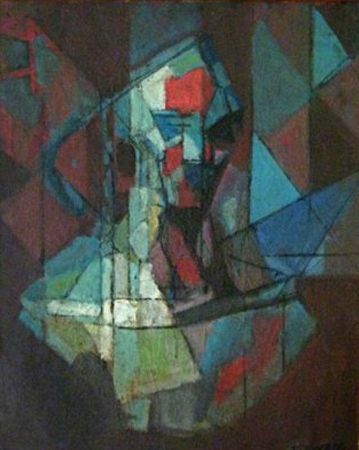 He showed his work in important shows alongside some of the greats of the early 20th century. His work is included in some of the great museum collections of this country. In the aftermath of his death, modern artists of huge stature such as Mark Rothko and Willem de Kooning proclaimed Kerkam to be one of the finest painters to ever emerge from America. Yet his work is basically unknown outside a handful of art insiders. His work sells at very modest, even low, prices at auction and I doubt if anyone who reads this will have ever heard the name. There could be many reasons for this relative anonymity. Perhaps his work is too esoteric, too caught up in the dogma of style or too personally narrow in its range of emotional impact. Perhaps his work was caught between eras, never really falling into a classification where he would be swept to the forefront of a wave. This might have something to do with it because, while his work is modern, it never really moved into the realm of the abstract expressionism that was the rage of the day. I don’t really know and looking at his work I found myself torn between liking it in some instances and being indifferent to others. I can see how both sides, artists and the general public, might take opposing views on his work. 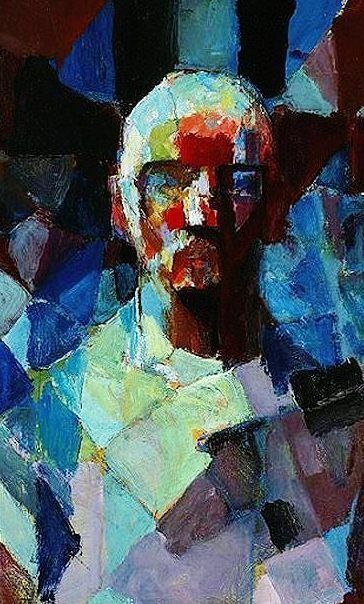 His work remains an enigma to me and I don’t know if I will ever see enough of it, or at least a single piece that could be called a masterwork, to make me say that he deserves to be among the beacons of mid-20th century painting or if he was simply a fine painter who garnered just the attention his work deserved. But for now, the name Earl Kerkam is at least on my radar and I will be open to finding other works from him that will move my perceptions. It’s just another reminder of who’s in charge from Mother Nature this morning as the temps here again sit at zero. There’s bright sunshine out there with the angle of the light making your mind believe that Spring is at hand and that, like the words of A.A. Milne in the bit of verse above, Winter is dead. Stepping out into it, you realize that it was just another cruel trick. The air is sharp like a fresh razor blade. More so because your mind was telling you it would be warmly caressing your skin instead of biting at it. Well played, Mother Nature. You got me again. But Spring is coming and the seemingly endless wait will make the arrival of green grass and the first peeks of bulbs breaking the ground all the more special. The beauty of contrast. The painting above is an old piece from about 1994 or 1995. It was among a small group painted at that time that was meant to have an object serve as a pole bisecting the picture plane with the light seeming emanating from it. 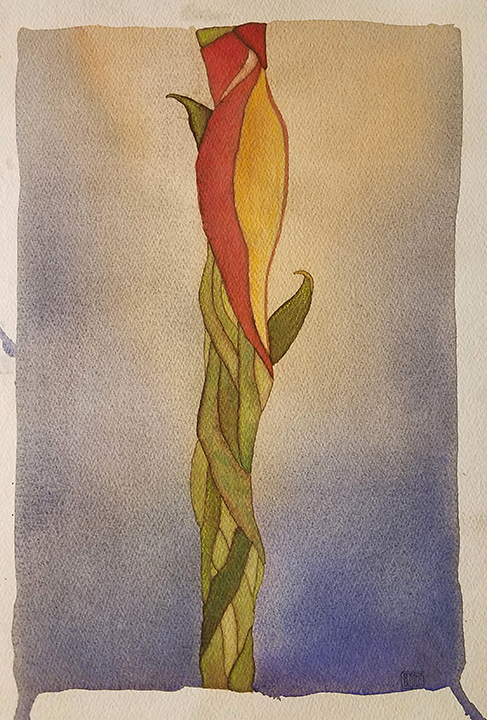 Kind of in a Georgia O’Keeffe manner. I did a few of these pieces with imagined flowers or tree trunks. Don’t know why I didn’t continue following this path because I am generally very pleased with them when I come across them. They have the sense of completeness and color interest that I still seek in my work. But at that point, every day of painting brought so many new discoveries and ideas that it was sometimes hard to decide which way to turn next. I had so many sparks being generated in my head that it would not have been possible to follow them all. That changes over time, of course. New discoveries are fewer and farther apart. Sparks still come, many with the same intensity, but they create a low banked fire now instead of the roaring blaze that it seemed like when everything was new. And that brings us back to Spring. Maybe that’s the attraction, trying to tie one’s own personal renewal to that of the Earth. If so, I will be green again soon. And that is a good thing. 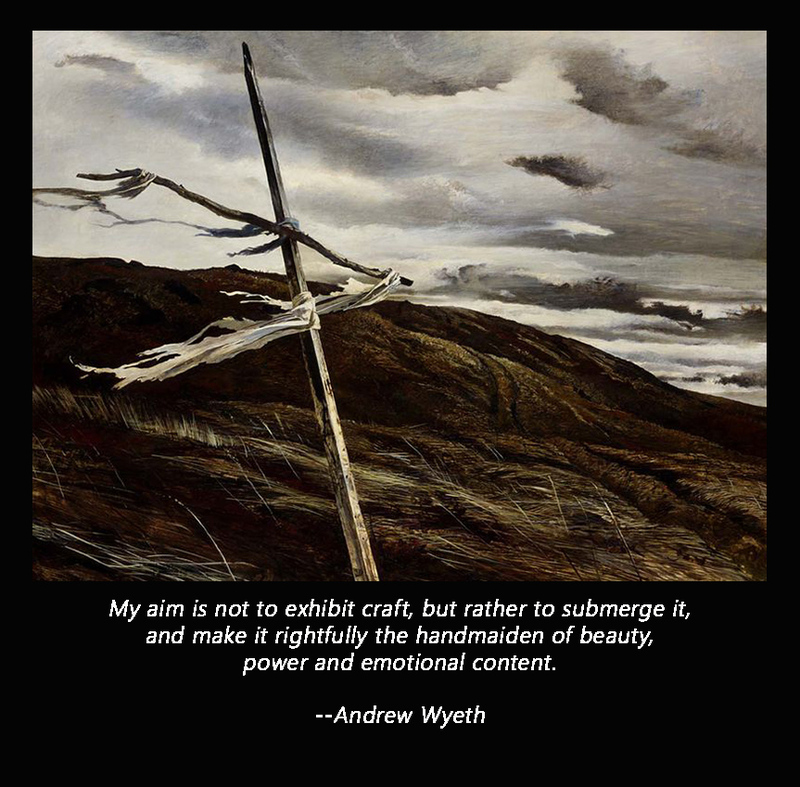 A little busy this morning but never too busy to stop for a brief moment to consider an image or a few words from Andrew Wyeth. The words and image above are a good example. I just love this quote. It’s an idea–that a piece of art should not be judged on its craftsmanship but on how well it conveys emotion and beauty– that has always rang true for me. Craftsmanship should not be seen as the goal but rather as a means, the handmaiden as Wyeth terms it, to get there. Got to get to work now. Have a great day!